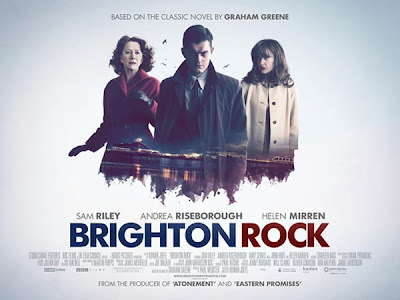 Brighton Rock charts the headlong fall of Pinkie, a razor-wielding disadvantaged teenager with a religious death wish. Filmed mainly as the title suggests in Brighton, Brighton Rock has some crucial scenes filmed in London including the scene where young criminal Pinkie Brown gets his first taste of freedom with a stolen Lambretta Scooter outside the Regency Cafe located in Pimlico. Rowan Joffe's remake of Brighton Rock perfectly captures the end of an era, and the Regency Cafe art deco look suits the films tone. 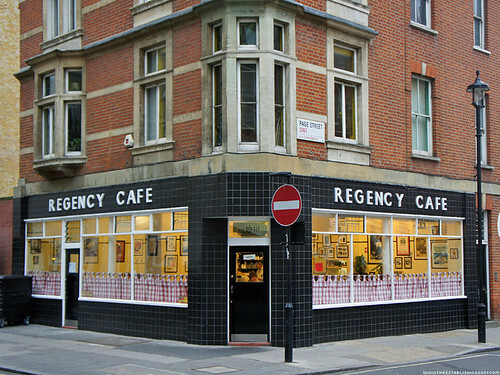 Film Location: Regency Cafe film location used in Brighton Rock & Layer Cake - Pimlico, London, originally uploaded by Craig Grobler. 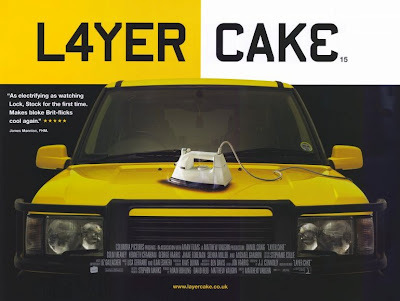 The interior of the Regency Cafe also played home to the brutal revenge attack Morty delivers to an ex prison colleague who interrupts XXXX (Daniel Craig) and Morty's (George Harris) breakfast meeting in Matthew Vaughn's Layer Cake.